Needless to say the AMD R9 290X runs a tad bit hot and the non-reference designs are highly anticipated due to the same reason. The PCB of the GTX 780 Ti HoF edition has just been spotted and this enthusiast edition is set to release around the same time as the R9 290X non-reference cards. The Hall of Fame editions of graphic cards are basically the GPU equivalent of a collectors item and are usually equipped with cherry chips and much higher clock rates. Of course i don’t need to mention their phenomenal coolers as well. You basically get the whole shebang at a raised price. 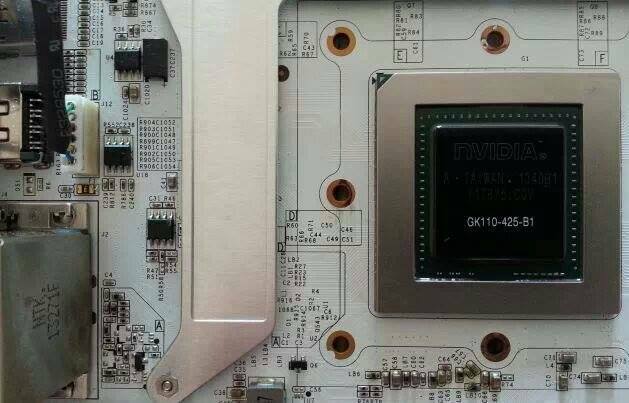 The picture leaked by a relatively unknown site is clearly that of the 780 Ti because of the text on the GPU chip ‘GK110-425-B1’ which is the exact B1 stepping core utilized in the GTX 780 Ti. There is no word on clock rates sadly although you can easily expect them to be greater than reference stocks. However interestingly there is word of 6GB version (hof). The connectors in this version are also 8 + 8 which is required for more stable clocks and a batter multiphase power supply system. Needless to say if you are one of those dedicated overclockers, this card will be a must buy. According to the leak source this card will be released in about 4 weeks; around the same time as the non-reference variants of the R9 290X come out. Convenient eh?